“We recognise that this is a difficult time for our country but we want to thank everyone who believed it was worth sending this team to the OFC championship,” says captain Phillip Mango at the Henderson Airport before the team’s departure. 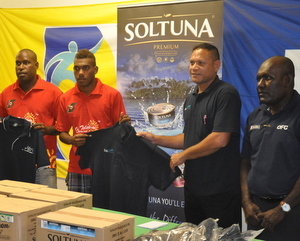 A united effort was made to send the team to the OFC Under-19 Championship with the national government, Our Telekom and the Solomon Islands National Football Teams Fundraising Committee raising the amount required for the team to travel to Fiji. More than twenty companies, individuals and organisations attended the corporate fundraising event which raised $200 000.00 for the team through purchase of tables, pledges and donations. While a handful of organisations are yet to pay their bills for the fundraising dinner the majority have. According to SIFF the support behind the team is very positive and is encouraging for the team and indicates widespread support for the Mamulas. “We are very thankful for the wonderful show of support from the community. Not only those who contributed financially but also those who put in their time and effort to help the team. We are encouraged greatly and want to thank each and everyone for their support,” says SIFF Chief Executive Officer, Neil Poloso.